Just 5 days into our kickstarter project and we are over 8 thousand dollars. And now, after 105 people have pledged we have been asked to take down the project. We have our suspicions of what happened and for those of you involved, shame on you. 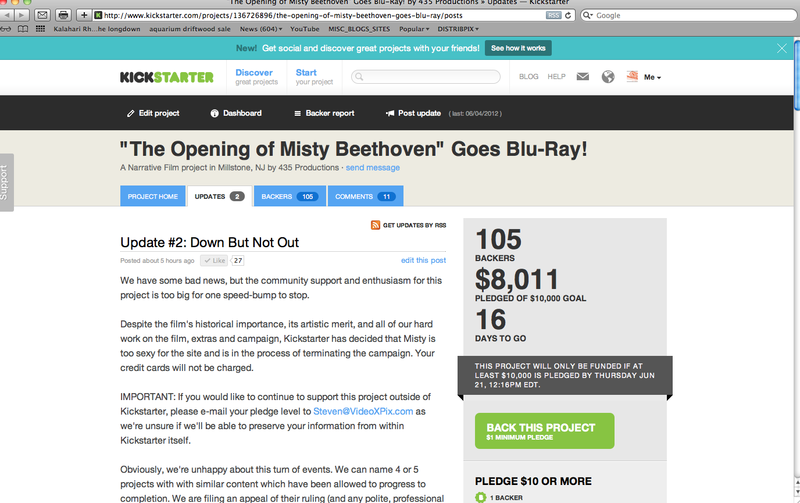 This “Misty Beethoven” project is on par with some of the greatest film restorations in the history of modern cinema. In reality, I was fortunate enough to have an in depth conversation the other day with a colleague of mine. He just happens to be doing the 4k scan of Speilberg’s JAWS, and we were totally talking shop. He was amazed at how much work we have done to our film, and he told me that the type of work I am doing, is very similar to what they are doing. Now, we are not Universal and we are not Speilberg, but I will take the compliment, especially from someone like that. The outpouring of support during the campaign and especially since this news has hit, has been intense. I have had at least 50 people who pledged, email me personally , to let me know several things—- that they are sickened by this news, that they feel terrible for us, and that we had one of the best kick videos and projects. Many let us know they would like to remain as a backer and still be involved with this project, in a huge way. And some of you, have even been gracious enough to increase your pledge levels. I will find a way to thank you. While we are well aware of the several other venues for this type of fund raising, we are no longer confident or comfortable with having our fans/backers and our campaign messed with any further. Quite frankly, if it was not for a stupid chain of events, the project would still be live on Kickstarter.com. So we have decided to find a way to make this an independent type of project. Our rewards are so amazing, we have been working on some of this stuff for over a year, it is all artisan quality and this merchandise is one of a kind!! So the best way to look at it, is that the KS thing, was a dry run, now we know we have the interest. And when we are back up, we will be sure to have an extra incentive, so that it is worth the hassle of having the backers re-pledge. We know this might not seem like the most legitimate way to raise funds, and it certainly does not have the KS platform and appeal, but I handle credit cards all day long, I take Pay Pal, and I can do this!! Who knows, maybe we have stumbled across a new way of independent project fund raising. But most importantly, we have raised over 8 thousand dollars, and our goal is 10k, from the looks of it, we would have easily exceeded the $10,000 limit. So with that said, I would love to see you guys re-join the campaign, once we have it formalized and have decided on the best approach. I promise you, that you will not be sorry, you are going to be blown away with this project. My team has put too much into this project, to have anything get in our way, we are determined! And I want you guys to know, every single one of you that made a pledge, you are now more than just a backer, you are now part of the Distribpix family. Stay Tuned for the latest details ASAP!! Shame Kickstarter became Nonestarter, but where there’s a will there’s a way! Keep up the good work. This will get done one way or the other. There is more than enough interest. You have my support 100%.